Lompoc is the best vantage point for all rocket launches on the West Coast. With unbridled lush hillsides, rich historic murals, a fully restored mission, and unique wine experiences, exploring space has never been this down to earth. With a mild Mediterranean climate year-round, Lompoc is ripe for adventure – golf, biking, hiking, surfing, and even sky diving! Lompoc has space to explore – where Highway 1 meets Route 246. Tour the Wine Ghetto and Sta. Rita Hills vineyards. Lompoc wineries are producing some of California's best wines! If you’re looking for great wine tasting, a visit to our 30+ boutique tasting rooms and production facilities won’t disappoint. If you like discovering one-of-a-kind, family-run restaurant, then Lompoc is the place for you. You’ll find local chefs, farm-fresh ingredients, craft beers, and amazing Central Coast wines, many made right in Lompoc. Lompoc features events a variety of fun events throughout the year, from Flower Festivals and Fly-Ins, to Wine Tastings and Mural Paintings. Plan your trip around one of the city’s seasonal iconic events or attend a Living History event at La Purisima Mission. Planning a conference, wedding, or group meeting? Consider Lompoc for a scenic, yet still affordable location, in Santa Barbara wine country. Ideal for gatherings of 10 to 300, Lompoc offers modern hotel meeting facilities, golf, wine tasting and small town charm. Lompoc venues are perfect for small to mid-size meetings and celebrations. With 12 hotels to welcome visitors, Lompoc is ideal for business, group, and leisure travel. Lodging options range from full-service, modern hotels to budget friendly motels. Lompoc has 12 Hotels & Motels to welcome you to the Central Coast. We've just launched our new LOMPOC FLOWER TRACKER! 🌼🌻💐 Updated weekly! Find out the latest on what's blooming and where to plan your perfect flower viewing adventure. We keep tabs on Lompoc's famous commercial flower fields, as well as our wildflower blooms that begin in April. Tour the most fully restored and furnished of the 21 California missions, featuring 10 buildings and 25 miles of hiking trails to explore. Don’t miss the living history events at La Purisima Mission scheduled throughout the year! Want to see some big art? In Lompoc it’s everywhere, with more than 40 murals throughout town, depicting scenes of Lompoc history, heritage, and diversity. See spectacular patches of colors when the Lompoc flower fields are in bloom, April through September. Stock, Larkspur, Delphinium, Sweet Pea and Bells of Ireland are just few of the varieties grown by our local flower growers. 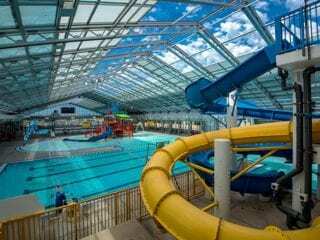 Lompoc’s state-of-the-art aquatics facility is one of the largest indoor water parks in California! It is available for recreational use, swim competitions, swim team training sessions, water polo tournaments, and private rentals. From in town wineries to scenic estate vineyards, Lompoc is home to more more than 30 wineries! Start your tasting adventure in the Lompoc Wine Ghetto … it’s one of the largest concentrations of world-class, small-production tasting rooms in the region. Discover one of the most picturesque beaches on the California Central Coast. Jalama Beach is a popular beach for picnics, surfing, kite surfing, bird watching, nature photography, fishing and camping. Lompoc is home to La Purisima Mission State Historic Park, with 25 miles of hiking trails, connecting to the back country. Most of the trails are sandy and lead through a mix of chaparral and oak. Sky diving on your bucket list? Then head to Lompoc, home of the highest tandem jump on the west coast. Take in unforgettable views of the coastline, hillsides, and vineyards below, and feel the adrenaline rush of this once-in-a-lifetime experience. Join us for one of our signature Lompoc events! We'd be delighted to host you at one of our relaxing hotels. Put your feet up and stay a while. Share your images with the hashtag #explorelompoc on social media - and keep on exploring! Catch the Newsletter for special hotel discounts, upcoming events and more!